New Age has one of the widest range in the industry and its ever increasing. Our product range ranges from Mineral Fibre & Gypsum Modular Ceilings and manufactures all types of Metal and Lineal Ceilings along with all the grid frameworks that go into such a system. We are constantly introducing new products into the market like smaller decorative ceiling tiles for residential use. Our average production capacity for modular metal Ceilings is 2500 sq. mtr. per day and grid/ framework production capacity are 9500 sq. mtr. per day. Our fully automated New Age manufacturing facility has a staff of 65 people, which includes an Administrative, Accounts and Quality Control Department. New Age has 10 branches strategically spread across the country to give our customers better accessibility and us better market penetration. 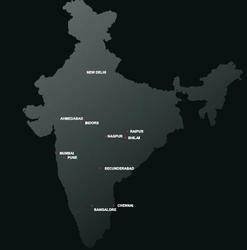 Our branches are located in Delhi, Ahmedabad, Indore, Raipur, Mumbai, Pune, Nagpur, Hyderabad, Banglore, and Chennai. We are looking to open branches in Surat, Jaipur, and Kolkata. To handle such a wide distribution network we have partnered with Mahindra Logistics for all our supply chain and logistic needs. This ensures that the manufactured material reaches our company owned godowns and in turn to our customers, in a safe, orderly and timely manner. New Age undertakes all installation/execution projects under its sister concerns Nagpur Aluminium Corporation and NAC Interior. Because of its extensive experience in the modular ceiling installation industry, New Age has been able to assemble a team of extremely knowledgeable engineers, architects, supervisors, and installers, who are capable of executing any job, at any time and speed, to ensure that the project is completed on time. We have an installation team comprising of more than 500 people spread across the nation working on various projects and average installation area of 200 sq. m/ 3 persons per day. Because of our national presence and experience in the industry, we can easily expand this number to 1000 people, if and when the need arises. With very high retention rate, most of our engineers, architects, supervisors, and installers have been with us from the start and have grown in experience with us, ensuring their expertise in this field.